Every year we must get another registration sticker for our motorbike, and every 5 years we must bring it to the transportation office in MaeSot for inspection. 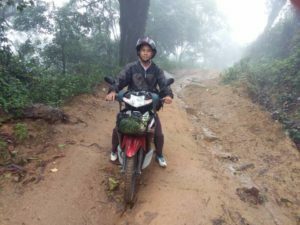 This year the time was up for inspection, so BletJhaw drove the motorbike two hours from Khane Chue to MaeSot. He went into the Transportation Office to purchase the registration sticker and then proceeded to the inspection building. He was thankful that only one car was ahead of him, because he needed to get back to pick up his boys from school. They are very thorough at this office. The motor is tested by a machine, the brakes are put under rigorous testing, the exhaust fumes are calibrated and the wheels and tires are inspected. It is driven, stopped, and revved up. Next the lights – signal light, brake light….”OH NO!” BletJhaw remembered that the high beams did not work! They had not worked for a very long time. We have a hard time seeing at night, but then again seldom do we need to drive it at night, hence, they have not been fixed. He sent up a quick prayer to God to somehow help him because he would receive a fine, and then have to go get the necessary repairs and return for inspection again. He really didn’t have time for that because he needed to pick up his boys from school. The low beam light was shone into a machine which registered satisfactory. Then to his complete astonishment, the high beam light came on and shone brightly into the machine! This motorbike had successfully passed inspection! With an amazed and grateful heart, BletJhaw drove the motorbike back to Khane Chue, picked up his boys from school, and then went to show his wife the high beam light….but it did not come on! It did not work before or after inspection! (We are getting it fixed now)!